This post was researched and written with Microcosm intern Lydia Rogue. As Microcosm kicks off its 23rd year, we’re taking a look at our history, starting with the building we now occupy with our office and bookstore. When we purchased the building in late 2013, it had already been around for sixty years! 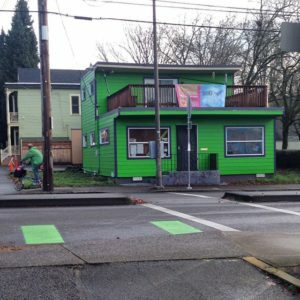 We painted over its dull beige exterior with bright green and purple paint that only upset one neighbor enough to leave some alternative sample paint chips taped to our door. The location was always zoned as a small office space, even when it was originally built in 1953. The original owners were H.C. Plummer & Co, a real estate agency who sold houses all over north Portland. 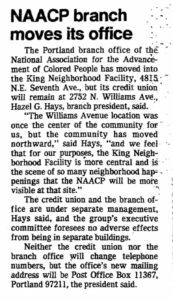 But it was in 1957 that the most famous occupant moved in – the NAACP moved their credit union here from the house of the organization’s leaders, Otto and Verdell Rutherford; by 1964, the NAACP also had their chapter headquarters here and it was the place you went to register to vote. Portland has a long history of racism, and during the 1950s and 1960s, the Albina district (where we call home), was one of the few places Black people were allowed to live. Most banks would deny them home loans – and real estate organizations deemed it ‘unethical’ to sell them a home in a ‘white’ neighborhood. 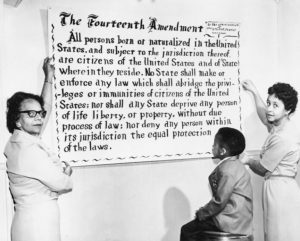 The NAACP advocated strongly for the community and against school segregation and racist real estate practices. Under the Rutherfords’ leadership in 1953, the historic Oregon Public Accommodations Act was passed, making housing discrimination illegal, among a wide range of other changes. 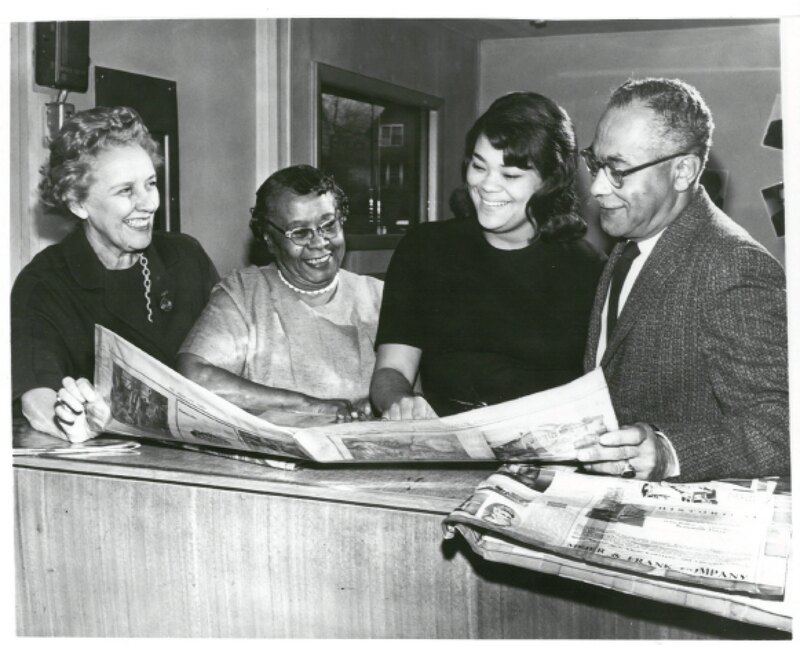 An undated photo taken at the NAACP headquarters – at the far right is Otto Rutherford, next to his daughter Charlotte. Photo courtesy of Oregon Historical Society. While most of N Williams has been gentrified over the years, buildings torn down and turned into parking lots and trendy shops, this building remains, nestled between historical markers that proudly document African American history all up and down the road. The NAACP remained in this building until 1983, when they moved to NE Portland. This Oregonian news article that ran on August 2, 1983. 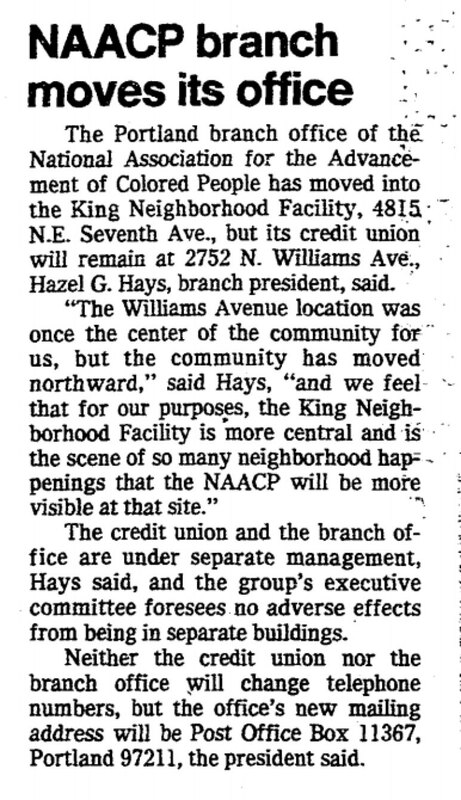 The credit union, however, remained for several more years, until the building changed hands yet again in 1990. This time, CH2A & Associates took up residency in the building – a consulting firm that specialized in affirmative action, labor relations, conflict resolution, personnel management, and counseling. Harold C. Williams Sr. co-founded the firm and was its president at the time of his death in 2012. He had been a community leader and on the board of directors for Portland Community College. His son (Harold C. Williams Jr.), following in his father’s footsteps, currently has an active political career. Now, we hold down the fort in this building, trying not to freeze in the winter or melt in the summer, and trying every day to live up to the activists who worked here before us.